Robert Aldrich | 50 Westerns From The 50s. 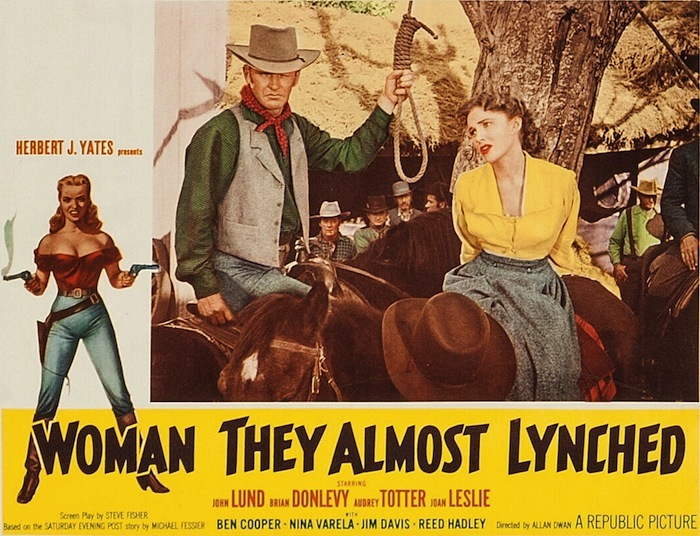 50s Westerns DVD News #167: Woman They Almost Lynched (1953). CAST: John Lund (Lance Horton), Brian Donlevy (Charles Quantrill), Audrey Totter (Kate Quantrill/Kitty McCoy), Joan Leslie (Sally Maris), Ben Cooper (Jesse James), Nina Varela (Mayor Delilah Courtney), Jim Davis (Cole Younger), Reed Hadley (Bitterroot Bill Maris), Frank Ferguson. Released a few months before Nick Ray’s Johnny Guitar (1954), and from the same studio, Republic, Dwan’s picture is just as personal. To me, it feels like he’s trying to see just how much he could get away with, really biting the hand that was feeding him. Maybe he was. His time at Republic was almost up, and he’d soon begin a terrific run with producer Benedict Bogeaus. Burt Lancaster Centennial Celebration At UCLA. With Burt Lancaster’s 100th birthday on the horizon, UCLA has put together a terrific program to celebrate one of the greatest stars of them all. Running through June, it offers up a great sampling of Lancaster’s career. For me, and readers of this blog, the best night of the bunch might be this Friday, with a 35mm screening of both Vera Cruz (1954) and The Professionals (1966). 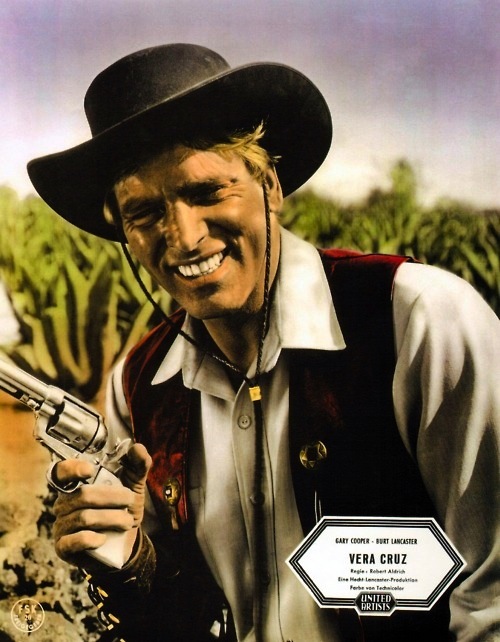 Both are terrific, with Vera Cruz being a highlight of the 50s Western. 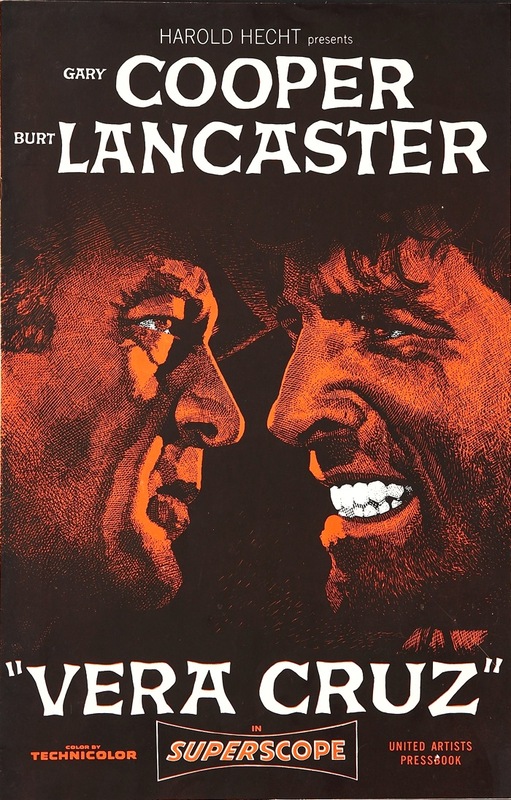 Like Shane (1953), it’s one of the films that fell victim to the widening of theater screens in the wake of CinemaScope. This time around, Robert Aldrich’s picture was cropped/blown up to SuperScope’s 2:1 ratio (it was probably shot for 1.85). Another great evening will be the June 7 screening of Gunfight At The O.K. Corral (1957), a film I find flawed but wonderful. Its VistaVision should be a gorgeous thing on the big screen. 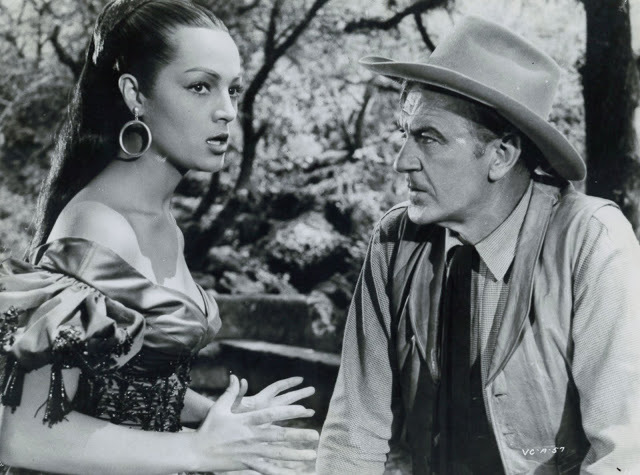 UPDATE: Burt and Coop’s costar in Vera Cruz, Spanish actress Sara Montiel, passed away today at 85. She was once married to Anthony Mann. 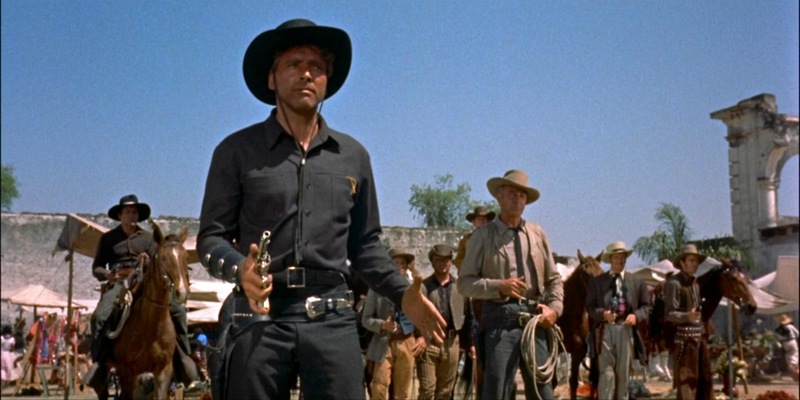 Here’s a shot from Robert Aldrich’s Vera Cruz (1954) to mark Burt Lancaster’s birthday. Compared to most of the major stars we celebrate on this blog, Burt made relatively few Westerns — but what Westerns they are: Gunfight At The O.K. Corral (1957), The Professionals (1966) and Ulzana’s Raid (1972), to name just a few. Ernest Borgnine On Gary Cooper. Cowboys And Indians magazine has an interview with the late, great Ernest Borgnine in its October issue. 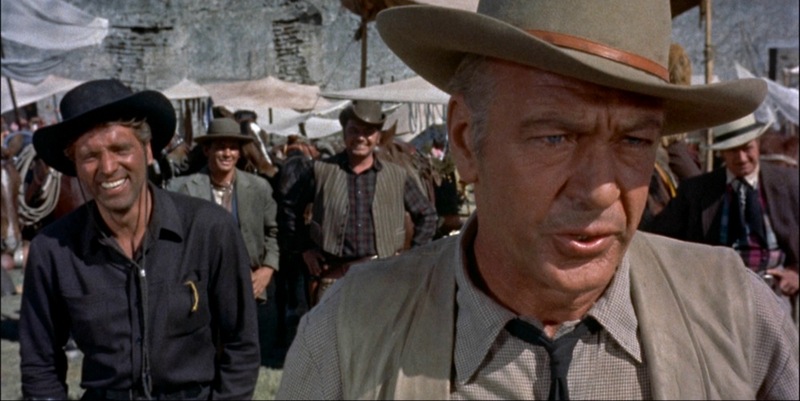 Here’s a short piece on Gary Cooper and Vera Cruz (1954). 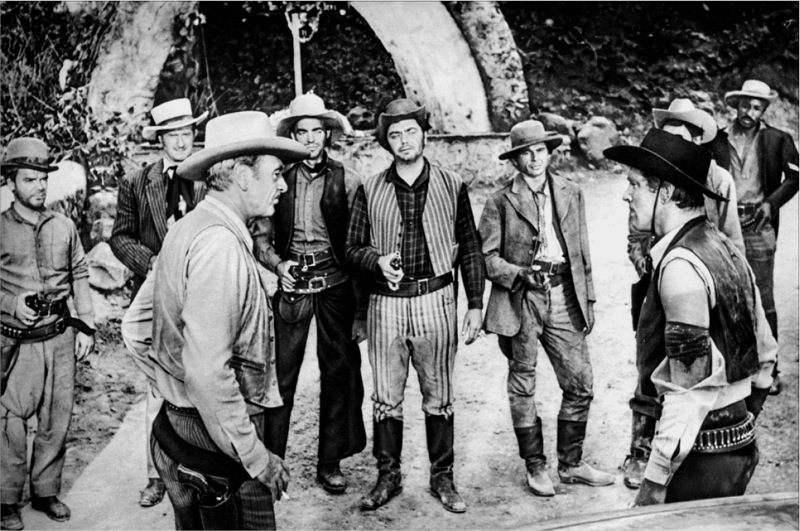 Image (L-R): Gary Cooper, Jack Elam, Ernest Borgnine, Charles Bronson, Burt Lancaster in Robert Aldrich’s Vera Cruz (1954). Denise Darcel, 1924 – 2011. Denise Darcel has passed away at 87. 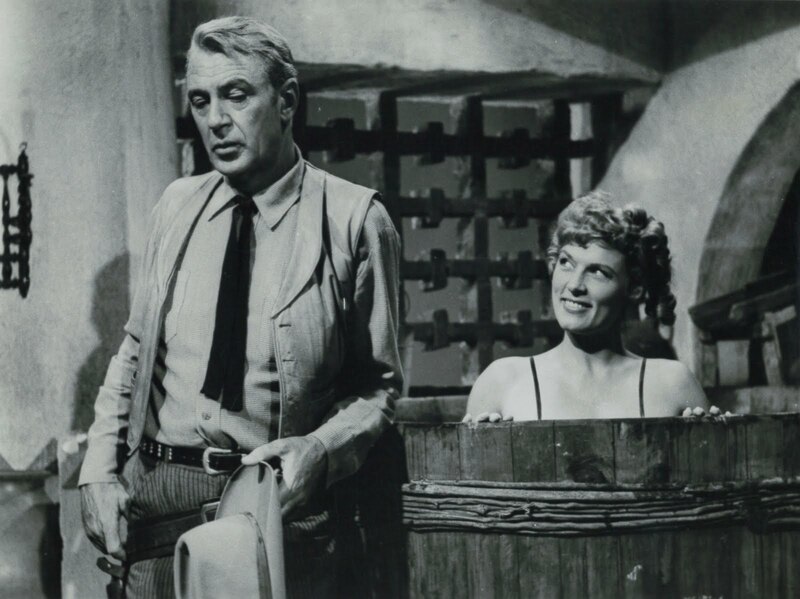 The French actress’s film career was a short one, but it included two important 50s Westerns. 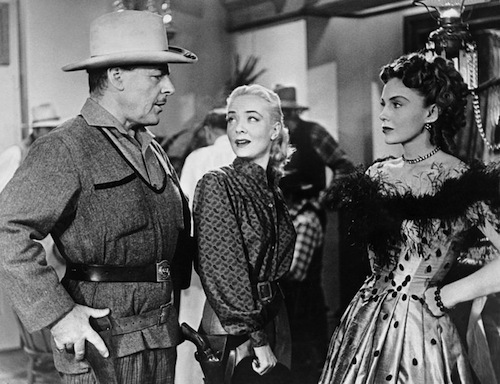 She’d previously appeared in Westward The Women (1950, below) along with Robert Taylor and an incredible ensemble female cast. She’s great in this one, handling the demanding physical stuff with ease. You’ll find obituaries for her here and here. 50s Westerns On Blu-ray. A Few More. Back in July of 2010, I covered 50s Westerns on Blu-ray — which was a paltry two titles (given, they were The Searchers and Rio Bravo). Not many have been added to that last, but the additions are substantial, pictures that are not only important titles in the genre and the decade, but films that were poorly represented in standard DVD. We’ve got The Big Country (1958, above). A stunning transfer of the Technirama film started out as a $10 Walmart exclusive and is now available elsewhere. 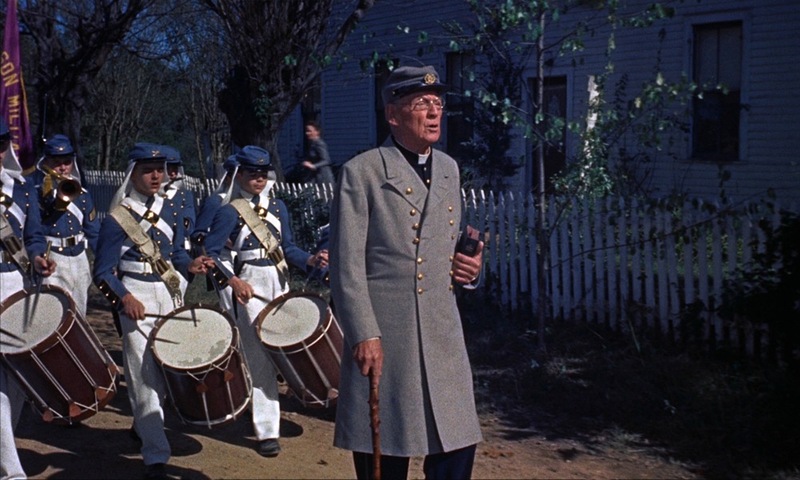 There was nothing good you could say about The Horse Soldiers (1959) on DVD. The Blu-ray looks so good, however, it invites you to give the maligned John Ford film another chance. And guess what? It holds up well, especially this scene. Robert Aldrich’s Vera Cruz (1954) has had problems with its presentation since SuperScope was thrust upon it after it had been shot. The Blu-ray recreates that 2:1 framing, but is careful enough to make it work. Rarely do you notice just how tight some shots are, and the overall transfer is miles ahead of what you’ll replace when you buy this one. Just think, at this rate, by summer of 2012, we might have, say, eight or nine 50s Westerns to chose from when we want ride into the 1080 sunset. Laura has pointed out that Deep Discount’s Summer Sale has rolled around again. It’s a way to save 25% off their already discounted prices through June 19. It’s a great way to get caught up on some things you missed or take the sting out of your gradual transition to Blu-ray. For starters, I’ll be snagging the new Vera Cruz (1954, above).